Miracle registered during the celebration of the Holy Mass on a photographic film in Bavaria on August 29th 1932. The picture shows a priest on the third day after his ordination. The photo was taken by his brother, a disbeliever, who did not believe that the Holy Mass is the Golgotha of our Lord Jesus Christ. St. Padre Pio: This is our second to last meeting, so I would like to tell you about the fruits of the Holy Mass. The fruits that I am talking about are the grace of God, which is given to those who desire to receive it. The Holy Mass is the sacrifice of the Golgotha, and thus its fruit is Life. Living the Passion of Christ, constantly accompanying Him under the cross, sensitizes the soul and makes it capable of receiving subsequent graces. And the subsequent graces are: humility, mercy towards neighbours, trust in the Will of God, the desire to repent, and finally the complete transformation of one’s life. Jesus does not call under His cross those, whom He does not want to have on his way of the cross. You are sentenced to accompany Jesus everywhere. The fruit of the Holy Mass is also this grace: the grace of giving glory to God by constantly calling on Him in thought, and noticing the dimension of the Golgotha in one’s own life. Each suffering, which is dedicated to God, becomes a sacrifice before the Majesty of God and might be a propitiation for the sins of mankind. The sacrifice of man is not worthless if offered to God, but by linking it in the heart and in thoughts with the Sacrifice of Jesus, we step into His dimension of the Golgotha and we nourish ourselves with the fruits of His suffering. And they are: perseverance in bearing life experiences, patience in suffering, trust in God’s mercy, generosity, and love. Living by the life and the death of Jesus teaches us to treat our life as a test, as a time of sacrifice, during which we can make amends to God for all our sins and for the sins of the whole world. A good participation in the Holy Mass changes the vision of the world. The world ceases to be an arena of struggle for existence, and begins to be a sacrificial altar, on which the humble victim submits only to the Will of God, not fighting for what is hers, not seeking anything, because she is in the hands of the highest Priest, who sees to it that the sacrifice is worthy and pleasing to God. How much time on earth we will win thanks to the participation in the Holy Mass. 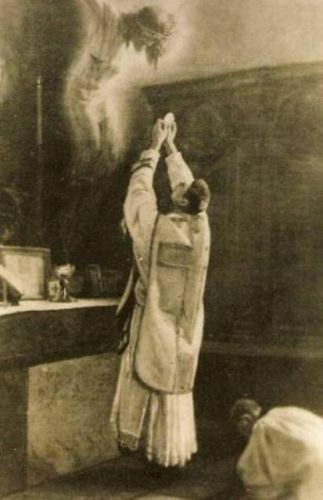 Each Holy Mass will leave in the soul an indelible trace. How many times we worthily participate in it, as many times God is glorified in it by us. The soul can not forget about her Creator, because the fruits of this Sacrifice are permanent. To participate in the fruits of the Passion of Christ, we must enter into His Passion and participate in it; not in our own. Strength and grace are in the suffering of Jesus; not in ours. Wanting to be new Christs, we can not suffer on our own account. God always accepts the sacrifice by Jesus and with Jesus. Never try to suffer without Him, because it does not please God. The Holy Mass is the Sacrifice of Christ. He is its center, as an atonement for our sins. We must now move these sacrifices into everyday life, and thus make the Sacrifice of Christ the center of every day, and subject everything to this Sacrifice and this Sacrificer. So let there be not a single suffering that we will not join with the cross of Christ, not a single mockery that we will not place at the feet of Jesus crowned with thorns, not a single temptation that we will not scourge in ourselves at the image of the suffering that Jesus endured for us when He was scourged. Every minute of every day can be holy. In every minute of our day God may be glorified and His wrath assuaged, the hearts of sinners transformed, and our souls lifted towards the eternal reward. However, for this to happen, we must take every minute of our day under the cross of Christ and see it and live it from this perspective, from the perspective of the cross of Jesus, to see how much our life by the grace of God – becomes the life of Christ, our sacrifice – the Sacrifice of Christ, and our reward, what we believe in, – the reward of Christ. Amen.